Diamond Fluorescence: Good, Bad or Indifferent? Fluorescence is one of the most misunderstood characteristics of diamonds. Is it bad and to be avoided? Or does it not really matter? And why do some people want it?? Fluorescence is generally seen as undesirable. But this is not necessarily true. If you're not careful, fluorescence can have a negative effect. But in some cases, it can make the diamond not only look better, but reduce the cost as well. We're here to shine some light on this subject. We'll go over what it is, when to avoid it, and why you may want it. Fluorescence is when a diamond shows a soft glow under ultraviolet (UV) light. This is caused by certain minerals in the diamond. This effect is totally natural, appearing in a third of all diamonds. 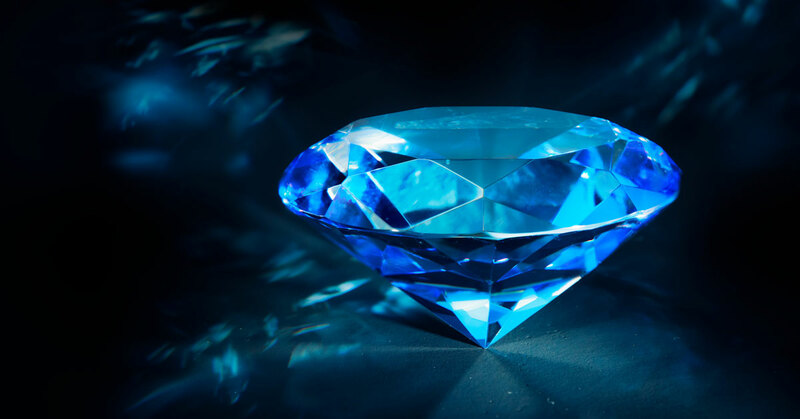 Most diamonds with fluorescence will glow blue. Less than 5% of fluorescent diamonds will glow yellow, green, orange, or white. UV light is like those black lights from back in the 80's. You know... the ones that make your teeth hilariously white. And of course, the sun also gives off UV light. So in some cases, diamonds with very strong fluorescence will have an icy-blue color in sunlight. Fun fact: It used to be that colorless diamonds with strong blue fluorescence (with no negative effect on appearance) were very desirable. This was called "blue white" and they were sold at a premium. It was thought that the blue fluorescence made an icy-white diamond even whiter and more beautiful. 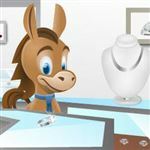 However, too many diamond retailers started using this term to sell their low-quality diamonds. This led to the Federal Trade Commission (FTC) banning the term in 1938. Since then, diamonds with blue fluorescence were thought to be generally bad. Fluorescence is determined by viewing the diamond upside-down under UV light. 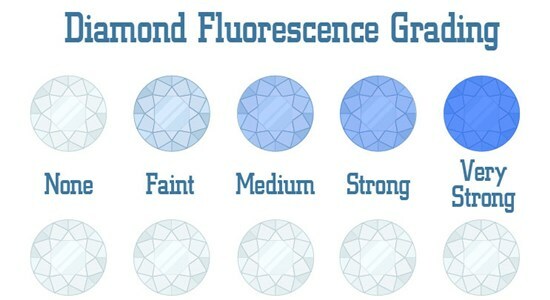 The different levels of fluorescence will impact a diamond's price and appearance. Here is how GIA (Gemological Institute of America) grades fluorescence. We also go over the general impact of the different levels. None: Diamond has no glow at all under UV light. Diamonds without any fluorescence are the purest and therefore, will usually be priced the highest. Tip: For diamonds graded by AGS (American Gem Society), you'll see the term "Negligible" instead. This is the same as GIA "None". It refers to diamonds with no fluorescence at all or fluorescence so minuscule that it's not worth mentioning. Faint: Diamond has a very light blue glow under UV light. Faint fluorescence makes no visible impact. However, for higher diamond color grades (D - G), you can save a few bucks as there will usually be a slight discount. Medium: A blue glow is easily seen under UV light. Medium fluorescence usually has no negative impact. In fact, it can help make a diamond with a slight yellow tint (H - K) appear whiter. Strong - Very Strong: A deep blue glow is very clearly seen under UV light. A strong fluorescence can make a diamond appear hazy or milky, especially if it's a diamond with higher color (G and above). Fluorescence tends to have a greater negative effect on colorless diamonds (G and above). Colorless diamonds with Strong - Very Strong fluorescence may appear cloudy and oily. This makes the diamond look less transparent. Often, even a casual observer can see the difference when compared to a diamond with no fluorescence. In the above example, the diamond on the left has a strong fluorescence. For comparison, I've placed a diamond with no fluorescence next to it. But keep in mind that this level of haziness is a rare case. I had to search for quite a while on James Allen to find this example. Usually, a strong fluorescence doesn't cause as much haziness in diamonds H or lower. But it's still a possibility. So it's best if you can inspect the diamond in person. Tip: What about Medium fluorescence on diamonds with high color grades? Usually, it has no effect. However, in rare cases, they could have a bit of cloudiness too. It's best if you can see the diamond in person and compare to other stones. To be on the safe side, stay away from diamonds with Medium-Very Strong fluorescence if the diamond is G or above. Fluorescence improves the color of diamonds with lower color grades (H and below). Diamonds below H have a faint yellow tint, and a medium-strong blue fluorescence can help make it look whiter by counteracting the yellow. Usually, a diamond can look one whole color grade higher. Above are two J color diamonds. The first one has no fluorescence, while the second one has a strong fluorescence. You can see how the second one looks whiter and brighter. This is great because you can save some money. Diamonds lower in color grade are significantly cheaper. So you can save a ton by buying a diamond lower in color with fluorescence, while having it appear whiter. Here's the good part! Since fluorescence is generally thought of as a bad thing, diamonds with this quality are often sold at a reduced price. Diamonds with faint fluorescence are priced the same (no discount), except for diamonds G and above in color. You may see a slight discount of 1%. Diamonds with medium fluorescence have a slight discount (2-7%) if the color is H or above. Diamonds with strong - very strong fluorescence have a bigger discount (3-15%) if the color is H or above. Tip: If you can find a diamond with strong fluorescence that has no noticeable effect on the appearance, that's some great savings. If you're buying online and not sure, a retailer like James Allen will have professional gemologists who can help you evaluate the diamonds. But remember - fluorescence can improve the color of diamonds with lower color grades. So in these cases, that's factored into the price. In diamonds with color I or below, a medium fluorescence can even increase the price a bit by 2-3%. The main reason to consider a diamond with fluorescence is the attractive savings potential. Diamonds lower in color cost a lot less. But one with medium - strong fluorescence can make it look like a more pricier, whiter diamond. A 1-carat, H, VS2 round diamond with an excellent cut costs around $5,500 - $6,000. With all other characteristics the same, a diamond with the color I and strong fluorescence cost around $5,000. But it can look as white as an H diamond. However, you will need to make sure the fluorescence does not cause haziness. If you're buying online and can't examine the diamond in person, make sure the retailer is trustworthy and will give you an honest opinion. To start, check out this Inspiration Gallery to help you choose the right setting and diamond for your ring. Brian Gavin is one of our favorite online retailers. It specializes in high quality super ideal cut diamonds. And another unique thing about this retailer is that it offers several product lines. One of which is "Brian Gavin Blue". This line offers diamonds with medium - strong fluorescence. Each diamond in the Blue line has been inspected by Brian Gavin himself to ensure that the fluorescence has no negative effect. Each diamond is still super ideal cut with top quality light performance. In other words, these are among the highest quality diamonds with fluorescence you'll find. 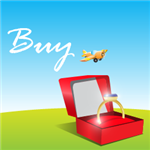 Brian Gavin offers his Blue diamonds at a great discount - as much as 15%. Below is an example of the price difference. Both diamonds are around the same size, have color of H, and clarity of SI1 (both viewed to be eye-clean). The diamond on the right costs more than $1,000 more than the Blue diamond on the left. Keep in mind: because of the high craftsmanship of Brian Gavin diamonds, their diamonds are usually priced higher than other online retailers. But you are paying for diamonds with superior light performance. And the Blue diamonds are guaranteed to have no negative effects. Fluorescence causes the most negative impact in diamonds with high color grades (G or above). A strong fluorescence can result in haziness. Medium to strong fluorescence improves the color of diamonds with lower color grades (H or below). Diamonds with medium - strong fluorescence are usually sold at a reduced price. However, if it improves the color of the diamond, it may then have a small markup. Faint fluorescence has no effect at all, on appearance or price. Really, how you view fluorescence depends on your personal taste. There is nothing wrong with having fluorescence, just as long as the diamond does not appear hazy. Personally, I think fluorescence makes a diamond more unique. And a slight blue glow can be very pretty. It's also a GREAT way to improve the color of a diamond without the extra cost. Just beware: a strong fluorescence could impact diamond appearance, so it's best if you can examine those stones in person. Share on Facebook "Diamond Fluorescence: What You Need to Know"